Eddie Huang said he’s currently working on a novel now. But when he first started writing a few years back and his literary ambitions were high, book publishers wanted a cook book, not a memoir. It’s the good cheese compared to the TV show, which is more like Cheez Whiz. Of course, you tread lightly in either event if you’re lactose intolerant. Me, I like both–his books and, slightly less, the sitcom–but for different reasons. The sitcom is a great vehicle for Randall Park and Constance Wu. But as I’ve said from the beginning, it’s still Eddie homogenized and sanitized for your protection. I prefer the more dangerous Eddie on his Vice TV reality series. 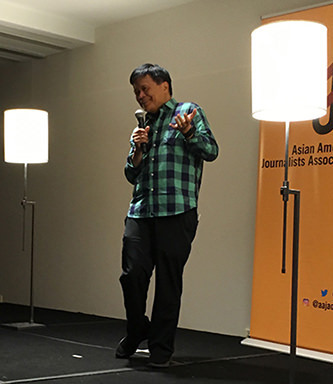 So it was a treat to see an even more organic Huang draped in a sultry weather caftan, holding forth at the Asian American Journalists Association convention this weekend in Philadelphia. It was the big awards banquet ,and Eddie was interviewed by NPR’s Kat Chow. He was asked about living his life so publicly. Just one of the gems from Eddie. There are many, including his takedown of Madame Tiger Mom, Amy Chua; violence in society and his interest in boxing; fiction and memoir; unity and common ground with other communities, especially the African American community; an Asian American’s connection to the homeland; and what Eddie would have for a last meal and with whom would he have it with. Listen to the interview on this new episode of our podcast, Emil Amok’s Takeout. Eddie’s move to fiction is no surprise either. Some people say there’s more truth in fiction, though fact-oriented journalists go apoplectic at the notion of anything made-up or fabricated. But even in a fact-based world, there is a way to tell stories that are real and authentic and journalistic, and much closer to Eddie than not. 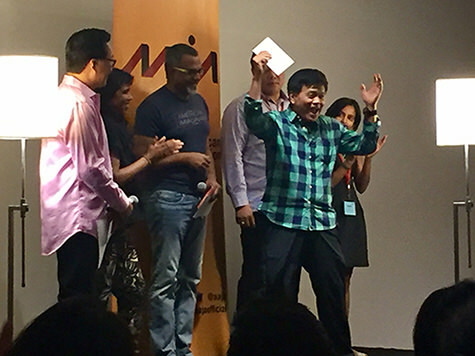 At this AAJA convention, it was the first year of what I hope will be an annual thing, a Moth-like AAJA Story Slam on Asian America. I was privileged to be a finalist and share the stage with five journalists who told their truths in very peronal and moving ways. It was just one person, live before an audience speaking from the heart, digital technology be damned. No props, Powerpoint, CGI, sound effects, video enhancers, or info boxes (although we probably could have had better lighting). It spoke to how all you need is one person with an Asian American story to tell. Eddie’s banquet interview made it all a nice capper to this convention. I’ve gone to more than 20 of these now. This year in Philly, AAJA, with its new logo and reinvigorated leadership as the industry limps along, seems to be going in a good direction. We just need to boldly tell our stories. 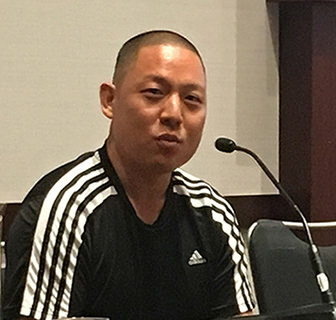 Listen to Eddie Huang at the AAJA National Convention on Emil Amok’s Takeout here.